Baptist MD Anderson celebrates new Walgreens cancer-based pharmacy - The Resident Community News Group, Inc. | The Resident Community News Group, Inc.
Top brass from Baptist Health, the Walgreens Corporation and the City of Jacksonville were on hand to celebrate Baptist MD Anderson Cancer Center’s grand opening of its new cancer-based specialty pharmacy located in the new San Marco facility Dec. 13. Those celebrating, which included Mayor Lenny Curry, President and CEO of Baptist Health Hugh Green, Baptist MD Anderson Medical Director Dr. Bill Putnam, Jon Reitz, regional vice president of Walgreens, City Council President Aaron Bowman and his wife, Debbie, and At-Large Group 5 City Councilman Samuel Newby, made note that the cancer-based, full-service pharmacy was not only a first for Jacksonville and the Baptist MD Anderson Cancer Center but also for the entire country. “This pharmacy is a good reflection of having all you need in-house,” said Putnam before the ribbon-cutting ceremony. “It reflects our entire model of surrounding the patient with every aspect of the care they need, whether it’s medical oncology, surgery, radiation, chaplaincy services, specialty oncology services, dietary nutrition, or speech therapy. All these things are what we want to provide to give our patients an extra advantage with their cancer care. With a staff of pharmacists trained to specialize in handling cancer drugs, the onsite pharmacy is meant to give personalized service to patients, offering them the ability to better focus on their treatment, which may include infused and oral medications as well as supportive care medications to prevent and manage side effects during treatment. Also included in the pharmacy’s services will be Walgreens’ new Feel More Like You™ program, which is available at more than 400 stores across the country and was developed to help people living with cancer and their caregivers manage potential physical changes associated with cancer treatment. Walgreens and Baptist Health first began their collaboration in 2016, and the next year Baptist Health opened retail pharmacy operations under Walgreens ownership at Baptist Medical Center Jacksonville and three retail health clinics in Walgreens stores throughout the city operating under the “Baptist Health Clinic at Walgreens” brand. 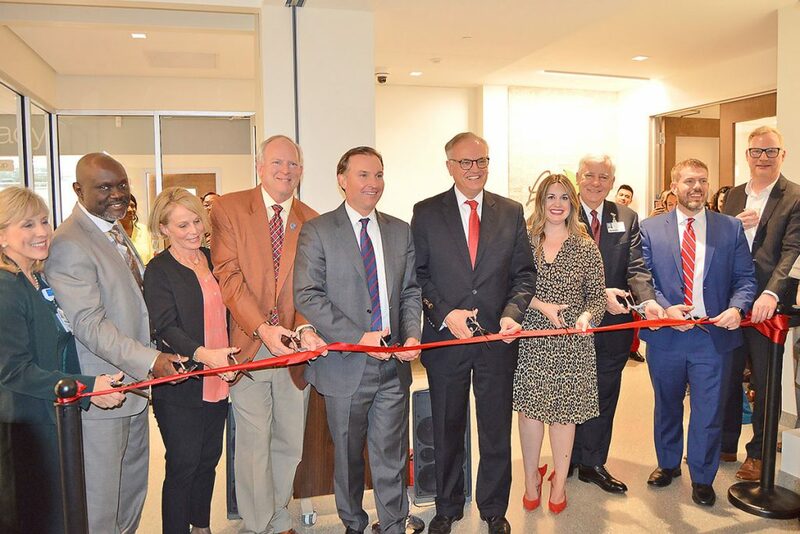 The event also celebrated the grand opening of the cancer center’s Life Wellness Center, a retail shop next door, where patients and survivors can receive wellness services and purchase specialty products associated with cancer care. “The Life Wellness Center provides privacy, especially for the women who face breast cancer by helping them with their needs post-surgery,” Greene said.